It has a very “pretty riverside setting” on the Cam in the midst of Midsummer Common, but that’s not why Daniel Clifford’s Victorian Villa is so often hailed as an “amazing destination”. It’s the “stunning cuisine from start to finish” which creates a “seriously top-notch eating experience” with the only option in the evening being an eight-course tasting menu. However, even fans acknowledge that it is decidedly “not cheap (call your bank manager first)”, and while for most diners “it’s well worth every penny”, there is a significant disgruntled minority for whom the final bill is “way over the top”. Daniel Clifford’s “haven of calm and delight” occupies a beautifully located Victorian villa bordering Midsummer Common and the banks of the Cam (“lovely river views from the lounge”), and continues to maintain its renown as one of the country’s top culinary destinations. From a series of tasting options (including a vegetarian menu), results from the open kitchen are “adventurous without being silly” and “the theatrical presentation which accompanies each course course truly makes for a meal to remember”, complemented well by a “brilliant choice of wines” and “exceptional service with a smile”. “Excellence doesn’t come cheap” however, and although major disappointments are rare here, mild panic on the arrival of the bill goes with the territory. “What a revelation to find this gastronomic oasis in Cambridge”; Daniel Clifford’s Victorian villa – “fantastically located” on Midsummer Common, by the Cam – is nowadays one of the survey’s top 5 most commented-on destinations outside London and, with the help of his team and continual investment in the property, it “radiates classy self-confidence”. “An updating of the dining room with an open-plan kitchen has led to a far more relaxed atmosphere”, there’s “an upstairs bar overlooking the river”, and the option to “end with coffee and petit fours in the walled garden” when the weather’s fine. “Superb” staff deliver “a wonderful array” of “spectacular” dishes (plus “well-chosen wine pairings”) “with just the right degree of theatre”, and you choose from a series of “innovative tasting menus, with a choice as to the number of courses”. No prize for guessing the catch! – even fans can choke on the “London prices in the provinces”. “An ideal location next to the River Cam adjacent to Midsummer Common” provides a glorious setting for this fine Victorian riverside villa, where “Daniel Clifford is pushing on to new levels” – reporters rated it No. 2 in our Top-100 UK Restaurants this year, and some would argue that Michelin should bestow it that third star. “The level of detail is second-to-none” and the “spectacular and surprising food combinations” create “complex” and “exciting” dishes, delivered by “attentive but un-cloying” staff. Even many fans though feel it’s “too expensive”. Have you eaten at Midsummer House? 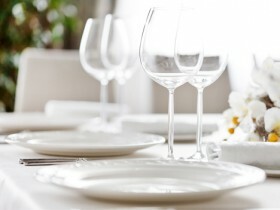 Reviews of Midsummer House Restaurant in CB4, Cambridge by users of Hardens.com. Also see the editors review of Midsummer House restaurant. "Very disappointing meal with pretentious service"
"Excellent. Can’t wait to go back"
Post your own review of Midsummer House and contribute to our annual restaurant review guide.